Beta-carotene is a form of provitamin A that’s converted into vitamin A by the body as a product of metabolism. Because beta-carotene is water soluble, the body converts what it needs from plant sources and excretes any excess. 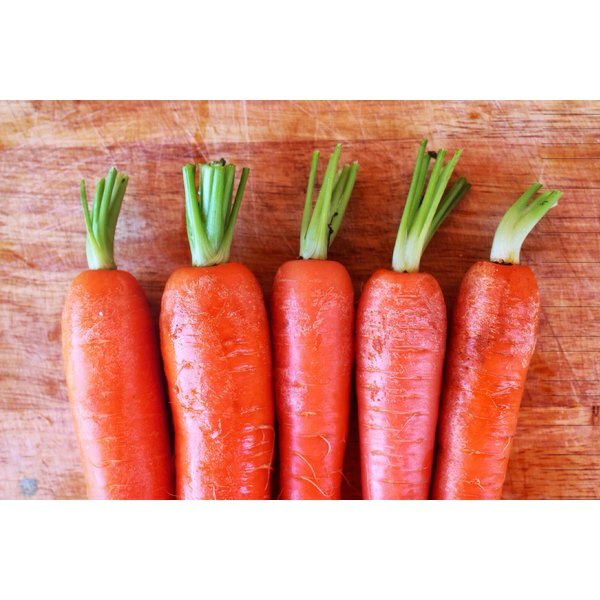 Numerous studies have shown that dietary beta-carotene is effective against ultraviolet radiation damage. The journal Photochemistry and Photobiology reports that 10 weeks of beta-carotene supplementation provides an SPF of 4 and that every additional month of supplementation increases protection. Additionally, numerous studies have concluded that dietary and vitamin A supplementation is effective as a treatment against chronic hand eczema. The British Journal of Dermatology reports that a medication made from condensed vitamin A named alitretinoin, which is normally used to treat skin lesions, also cures chronic hand eczema. Dermatologic Surgery reports that vitamin A supplementation is effective in reducing tumors in patients with nonmelanoma skin cancer. But before you go crazy for carrots, know that it's possible to have too much a good thing. There are popular stories about people’s skin turning orange from eating too many carrots and many people wonder if the stories are true. They are, and the International Journal of Food Sciences and Nutrition reports that overindulgence can turn your skin and the whites of your eyes to tints of orange and yellow, a condition called hypercarotenemia. Researchers determined that ingesting 20 milligrams of beta-carotene per day, which is the equivalent of three 8-inch carrots, is sufficient to pose a risk. Does eating carrots give you good skin? What other foods make your skin glowy and clear? American Journal of Clinical Nutrition; The Acute and Chronic Toxic Effects of Vitamin A; K. Penniston, et al. Photochemistry and Photobiology; Protection From Sunburn With Beta-carotene; W. Kopcke, et al. British Journal of Dermatology; Alitretinoin in Severe Chronic Hand Eczema; R. Bissonnette, et al. Dermatologic Surgery; Chemoprevention of Nonmelanoma Skin Cancer; C. Otley, et al. International Journal of Food Sciences and Nutrition; Studies on Hypercarotenemia; N. Wageesha, et al. Annals of Internal Medicine; Excessive Dietary Intake; H. Melhus et al. Larry Armstrong began writing articles professionally in 1986. These articles have appeared in scientific journals such as “Hypertension” and “American Journal of Therapeutics." He received his Doctor of Medicine from the Baylor College of Medicine in 1985. His fields of expertise include medical physiology and biochemistry. What Are the Advantages of Eating Oranges?